I recently picked up a new addition to my adventure riding luggage arsenal, the small but mighty Giant Loop Klamath Tail Rack Pack and I wanted to share some of my thoughts on why I prefer a tail bag. 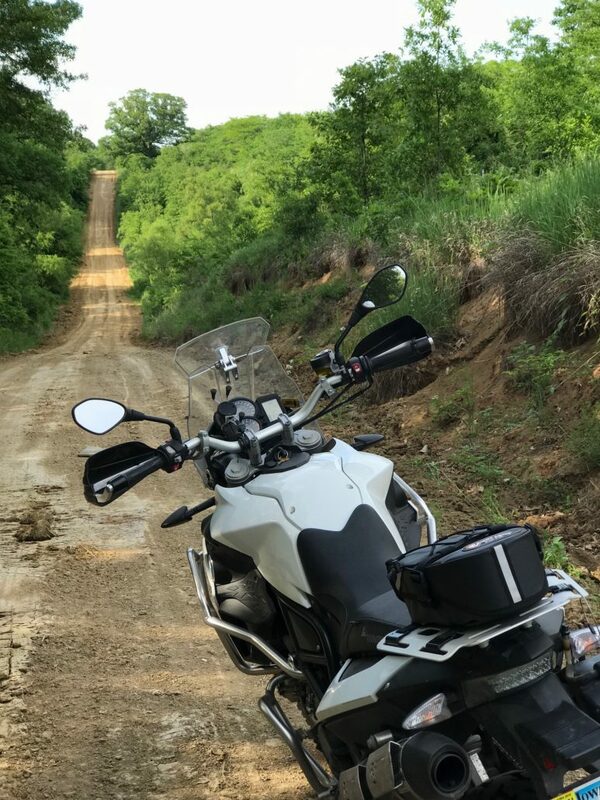 I have always preferred tail rack bags to tank bags for a few reasons. One, I think they look better. Two, I think they offer the rider more ergonomic comfort while riding off road and at the gas station. Finally, they are more versatile when adding other luggage options for different kinds of trips. There are many manufacturers who make tail packs of varying sizes. I personally like the Giant Loop approach to the tail bag. For one, I like the forward thinking in the packs construction and ergonomics; Waterproof, durable, low profile, and easily accessible while wearing motorcycle gloves. The exterior clam-shell design whisks water away from the bag itself, but the entire interior of the bag is made with a waterproof liner. This means no more fastening a draw string each time you close it. Many other manufacturers produce a bag that contains an interior waterproof bag or pouch to keep the contents dry but leaving the exterior material sopping wet in a rain storm. The Klamath’s forward thinking design deploys a rigged but soft exterior design that will repel water around the pack itself. Keeping the water away from the interior waterproof compartment all together. The bag also opens and closes with just two side mounted buckles. This makes opening and closing the tail pack easy even with riding gloves on. 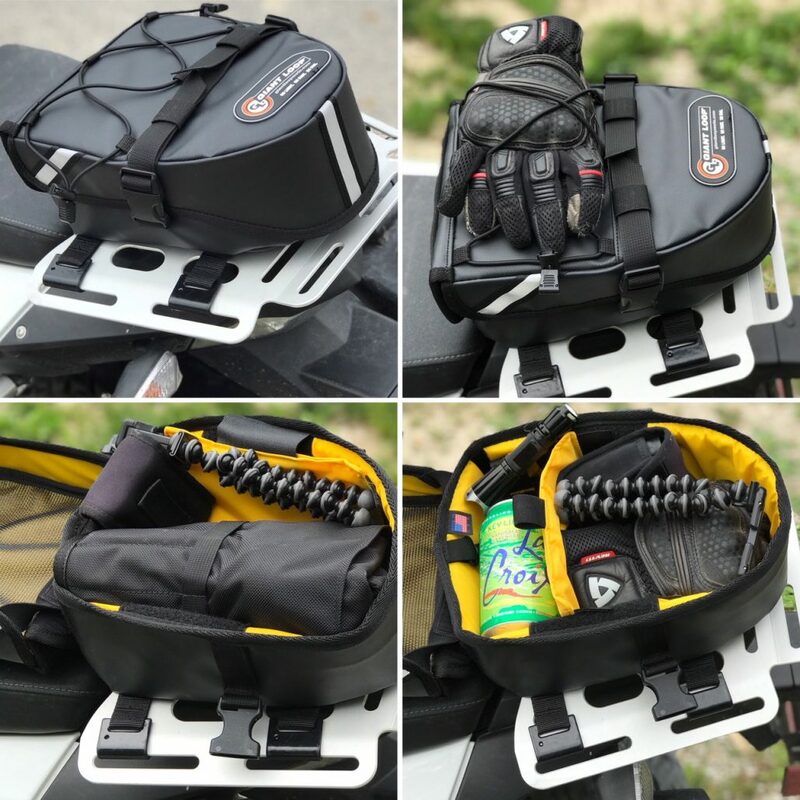 Unlike many of the other available tail packs or tank bags, which rely on zippers to open and close the bag. The interior space is bright yellow for visibility and offers a way to separate items easily. Mesh pockets are also available on the bag to stash small items securely. As many of us have experienced, opening and closing a zipper on a brand new motorcycle bag may not be an issue, but a zipper worn down with time or exposed to rainy or dusty conditions can be difficult to operate. No such issues with the simple buckle closures on the Klamath. 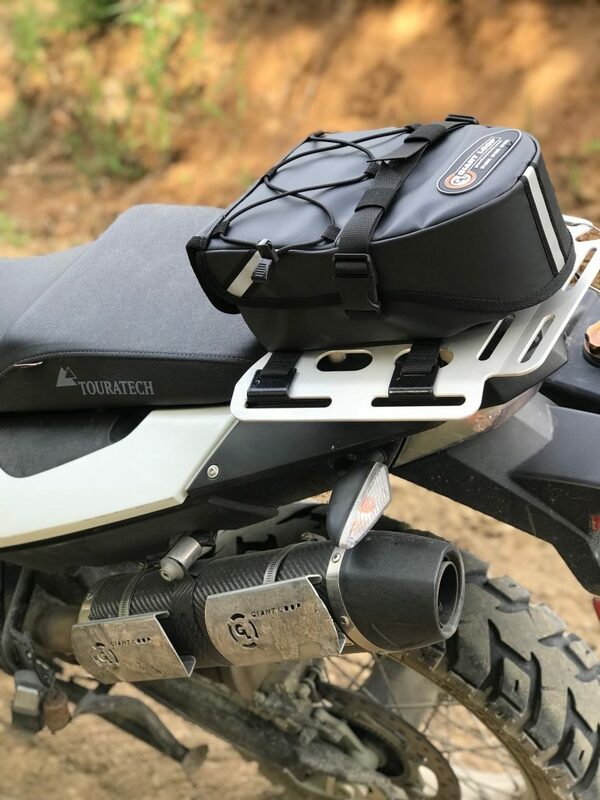 While a tank bag does contain some immediate convenience for the rider, like being able to quickly access a phone or charging cable from the pilot position, I ultimately find that a tank bag creates as many problems as they solve. On my BMW F800GS for example, the attaching straps for a tank bag will obstruct access to the key location. On other bikes they restrict the operator from easily accessing the gas fill location. You do not experience any of these issues with a tail pack that is situated unobtrusively at the rear of the motorcycle. Depending on its size, a large tank bag may also limit the ability of a rider to move freely around the bike during different riding positions. This isn’t an issue with a tail pack. You never even notice it while you ride. It stays securely in place. With the interior Velcro locking design, I have never had an issue with the Klamath moving around while riding off-road for hundreds of miles. Then comes the looks. Ascetically, I don’t think there is any comparison between a solid tail pack like the Klamath, and a tank bag. The mounting options are much more discrete and help protect the intended visual lines of the motorcycle. Keeping the visuals of the bike much closer to the manufactures intentions. I also find that a tail pack gives you some versatility when adding additional luggage for larger trips. It can neatly compliment side panniers like the Mojavi Saddlebags or the MotoTrekk Panniers. So when planning a big trip, you can choose to add it to your pannier system or simply leave it behind if something else suits you. With a reduced price point in 2018, I think you’ll be very happy to have this for your trip round the world or just as a tidy way secure a few essential items around town.